One of the UFC's most exciting fighters during the past decade is currently on a three-fight losing streak and in desperate need of a victory. 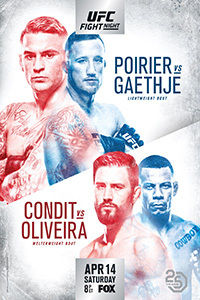 That fighter is former UFC Interim Welterweight Champion Carlos Condit, who fights Alex Oliveira in the co-main event of this Saturday night's UFC on FOX 29 card that takes place in Glendale, Arizona. Condit is coming off of consecutive losses to Robbie Lawler, Demian Maia, and Neil Magny and likely needs a win here to convince himself to keep fighting. He was originally tapped to fight against Matt Brown, but after Brown blew his knee out Oliveira stepped up on short notice and he and Condit should make for a fan-friendly fight. It wasn't that long ago that Condit was arguably the top welterweight fighter in the sport. Back at UFC 195, Condit and Lawler put together one of the greatest five-round fights in UFC history. But while many observers of the bout thought Condit would edge out a close decision, the judges decided to go the other way and give the nod to Lawler. That loss really put Condit in bad spot, as he previously lost in his bid to become the undisputed champion when he lost to Georges St-Pierre back at UFC 154. Despite the amount of damage Condit took against Lawler, he decided to come back eight months later at UFC on FOX 21, but put on a poor showing as he was tapped out in the first round by Maia. That loss led Condit to reconsider his fighting career, and he decided to take a leave of absence from the sport. After taking 15 months off of fighting, Condit decided to return to the Octagon and his return fight was against Magny. On paper, it was a fight Condit should have won, as he is the more durable fighter with the better striking. But the fight did not play out that way at all. In what was probably the worst performance of his career, Condit was picked apart by Magny and lost a wide unanimous decision. Condit really didn't throw many strikes in the fight and kind of just stood there getting beaten to the punch. It was a sad showing by Condit considering how incredible he's looked in the past, but really not all that surprising considering he was just coming off of a temporary retirement. 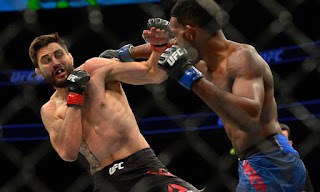 Whenever a fighter is thinking about hanging up his or her gloves it's not a good thing, and Condit didn't show anything in the Magny fight to make anyone believe he still has what it takes to make another run for the title. It was strange seeing him fight with such little aggression based on the way he's fought his whole career. Clearly, though, Condit himself doesn't think he's done just yet, and the bitter taste of three straight defeats has motivated him to return for another fight. The original matchup pitting Condit against Brown was a dream matchup for MMA fans, but unfortunately Brown got hurt and had to pull out. 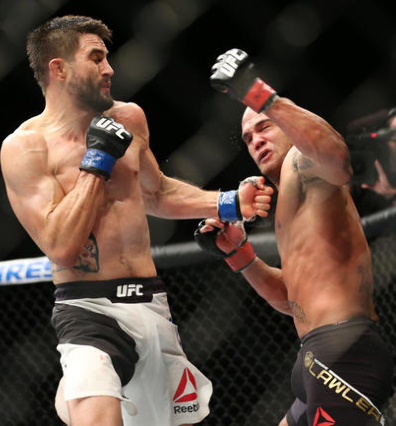 Instead Condit will now take on Oliveira, who shockingly has the same number of UFC wins (seven) despite having only competed in the UFC since 2015, compared to 2009 for Condit. 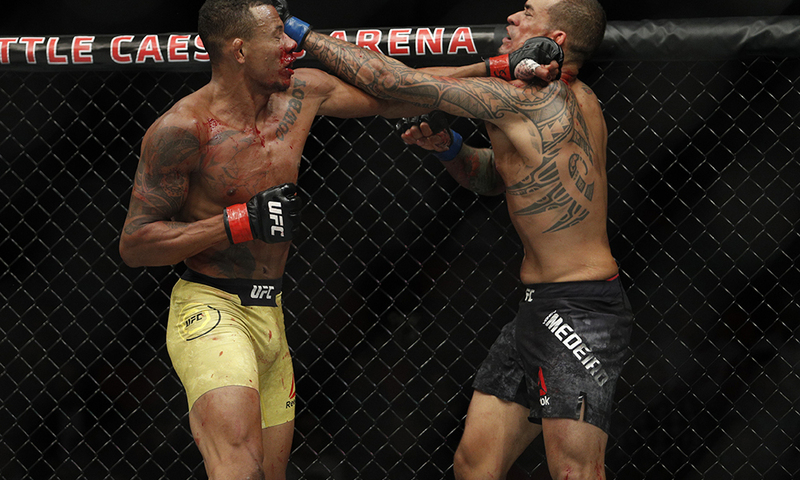 Oliveira is coming off of a brutal TKO loss to Yancy Medeiros and took this fight on really short notice, so there are some things going Condit's way in the matchup. But overall it looks like another tough fight for Condit, and he's the underdog heading into it. As a longtime fan of Condit, it's been hard to see him decline so suddenly, but that's what happens in this sport. When you've had a career as long as Condit has had and have taken as much damage as he has, at some point Father Time will catch up, and it seems like it finally has. Condit is still a guy who will likely be in the UFC Hall of Fame one day, but if he loses this fight I hope he can look long and hard in the mirror and really decide if he wants to tarnish his legacy like other fighters have in the past by fighting long past their expiration dates. And even if he wins, it wouldn't be the worst thing in the world to go out on a victory like the great Chris Lytle once did. On paper, Condit vs. Oliviera should be a great fight, and we'll find out Saturday night exactly just much "The Natural Born Killer" has left in the tank. It might be his last fight, so make sure you find a way to watch it and appreciate one of the welterweight division's all-time greats. UFC on FOX 29: Poirier vs. Gaethje takes place April 14, 2018 at Gila River Arena in Glendale, Arizona.